Love is similar to like, and Coke Zero is a lot like what it isn’t, actual Coca-Cola. In a staggering moment of poor judgment, the world’s premiere soda company stripped the last vestige of cocaine from its beverage about 500 years ago, and we have all been paying the hideous cost since then. Consider what easily could have been, had there been a widely consumable brand of hip, with-it narcotic for every non-laboring school child to consume. A man and nation can dream. Let me tell you about my love of Coke Zero. The first thing you must understand about Coke Zero is that it is the widow-marrying of soft drinks; a replacement. It is a substitute for the thing you had, a stand-in for something that has passed into oblivion. That’s how it begins. It ends by making you forget that you ever liked the first thing, much as Michael Jackson eclipsed the Jackson 5, or how climate change will eventually wipe out all our worries about doping in baseball. Now, even if I could go back to original Coke, I wouldn’t. 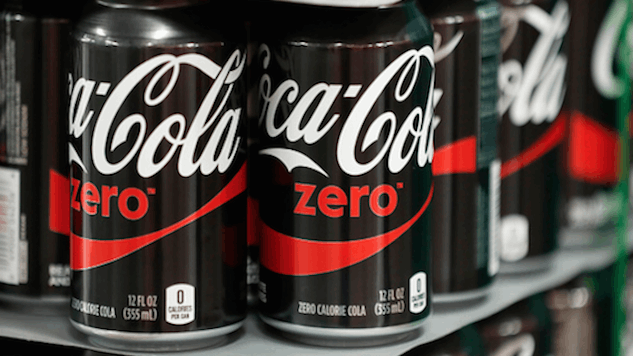 Coke Zero is a replacement for the raw real thing, Coke. It says it right there on the can. It is Coke, but ZERO. And if you drink Coke Zero—as you must—you do so while normie Coke is still tantalizingly available literally everywhere in the human globe. In the early days of switching, to even buy Coke Zero is an act of discipline. When I began to drink Coke Zero, I had to pass by Coke in bitter silence. I had just come back from Oklahoma and was at my most full of life, by which I mean calories, which you must have to live, as the arbiter of truth, Twitter, informs me. The rude science of eating was driving me towards the world of Wilford Brimley-esque diabeetus and its logical conclusion, limb amputation. If my arms and legs must fling off my body due to my own action, I’d rather it happen in a much funnier way, like boozing on a roller coaster or being in blood-debt to the narco-cartels, or keeping my promise to a hospital—not from cracking back a sugary thirst-quencher with the boys. And, truly, if you know anything about me from my writings, you must have guessed by now that I love only to crack open a cold one with The Boys. It is my primary function in this game of life, along with screeching out show tune requests at funerals. I loved Coke. I loved Coke like whoever the people in The Notebook were who loved each other. I desired it like the Girl with the Dragon Tattoo craved reptile-based body modification. I loved it like some people love heroin, except I was unable to die from my consumption of it. There was no end to the number of shocking crimes I would commit to fulfill my undying thirst for corn syrup suspended in a brown slush of cinnamon and caramel and God know what else. But those dreams were dashed by biological reality, so onto Coke Zero I went. You may be asking, what separates this feature from a commercial extolling the virtues of this drink? I’ll tell you what: practically nothing. I am not paid directly by the Atlanta-based Coca Cola Company of God’s America for this, although I would clearly like to be. Realistically, the only recompense I will receive for this awkward love letter is a smile, which I am sad to inform you, cannot be transformed into firearms through the magic of the free black market. This is not even the feature that I wanted to write about Coke. Not that I am unable to write that feature, but because no man, beast or superbeast could comprehend my connection to Original Coke, the chief beverage of my eager youth and wild adulthood. If I could express my lifelong love of Coke, it would be like a church sermon which ends with a volcano full of monster trucks exploding. If my lifelong love for the flagship drink Coke could be transferred into rough mammal speech, you would weep in joy and then drive donuts across the Arizona desert, wondering if you could ever know such crazed, illogical devotion. If my love for Coke was transmutable by the art of brain-alchemy into prose, the resulting stream-of-conscious monologue would be somehow both uplifting and offensive, like Carson Daly’s life. Indeed, the resulting waterfall of words would not be word-based at all … but a constant stream of pure godly light beaming from every opening in my head: eyes, mouth, ears and nose. We’re talking Lawnmower Man levels of self-expression. Back in the glory days of ages zero to 29—if I’m lowballing it here—I probably drank 30 trillion cans of this stuff every day. It’s a miracle I didn’t lock myself in a toolshed and drink Coke until I understood the speech of angels. Coke Zero is what I have now. I have to live with the replacement. Otherwise, to quote from the Book of Leviticus, Lord help me, I turn back into the old me. But this is both fitting and proper and properly fitting. Our lives are full of replacements. To quote from the country-lament-in-song-form “Long Time Gone,” I have money but I don’t have Cash, but at least I have the simulated, liquified version of love, Coke Zero. One thing stands for another. Much as methadone stands in for horse, and guns are our replacement for Batman, I have Coke Zero, instead of actual sugared soft drinks to consume down the ol’ throat-pipe. Replacement is the natural order of things: after all, the moon is a scrub sun and the false light of bulbs is a poor excuse for space radiation, and Coke Zero stands for all the things I could be drinking but aren’t. As mortal humans, we’ll all be changed out ourselves, and replaced by new people—I believe they’re called children—so why not practice brand replacement while we’re alive? Replaceable parts are the opposite of chocolate boxes: you always know what you’re going to get.